An effort to nurture technology-savvy entrepreneurs through activities and projects that integrate the talents of University of Wollongong (UOW)’s students with the technological expertise of IBM, MDeC and other industry leaders took place as Technopreneur Week at INTI International College Subang (IICS). Highlights of the three-day event included the IBM WorkFlex Challenge Competition where 11 students from the Faculty of Commerce, Communications and Informatics presented on how collaborative tools and mobile applications could be used to improve work performance. 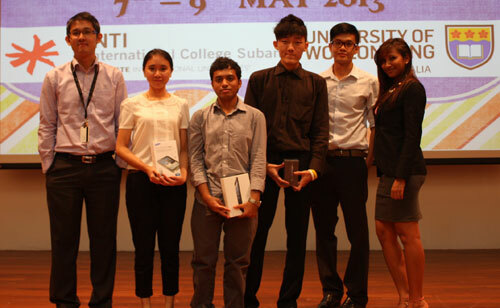 The panel of judges from IBM and MDeC were impressed with the students’ proposals and creative ideas, and the top three winners – Wong Weoi Xiang, Faiz Ahmed Fayyaz Mohamed and Lee Xin Yee – walked away with some of the latest gadgets in mobile technology which included an iPhone 5. 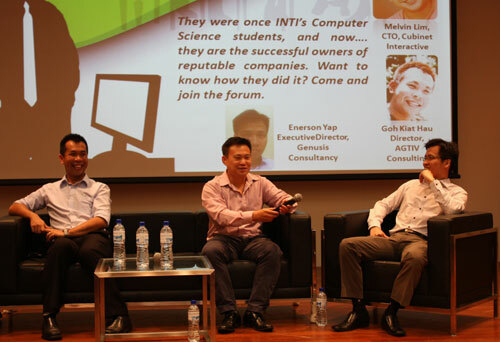 Forums featuring outstanding INTI alumni such as Melvin Lim, Chief Technology Officer of Cubinet Interactive; Goh Kiat Hau, Practice Director of AGTIV Consulting; and Enerson Yap, Executive Director of Genusis Consulting, as well as special guests including Karyn Mak, Chief Operating Officer of Senedi; Joanna Hew, Chief Technology Officer of Macro Kiosk; Wee Huay Neo, Director of SME C&I, MDeC; Evanna Phoon, Founder & CEO of Malaysia Wills; and Bobby Varanasi, Chairman and CEO of Matryzel Consulting Inc., provided students with insight into entrepreneurship and individual development. The annual UOW Technopreneur Week is a platform for innovative learning and a driver for career development. Each year, students from the UOW programmes at INTI take on the challenge of putting together a creative event that will enhance their soft skills and further prepare them for the real working environment. Aside from lectures, many initiatives are in place to help INTI’s students build up competencies through innovative learning. INTI’s students have undertaken 125 innovative projects in the past year in collaboration with industry partners. Real employer projects ranging from “Ways of doing business and how to setup a company in Myanmar” to “Development of a research book that identifies the changes shaping Malaysia’s marketing landscape and consumer behavior trends” were introduced in the classroom to help students develop problem solving, collaboration, communication and critical thinking skills. “Since Technopreneur Week is an event organized by students for students, I can confidently say that our students have achieved a great level of maturity, confidence and independence. They are able to carry out presentations confidently in front of their employer, make decisions with maturity and work independently. This is a learning experience that would prepare them for a successful career in any field that they may embark on,” said Dr Sumitha Ganesharatnam, Dean, Faculty of Commerce, Centre of UOW programmes. Working in partnership, UOW and INTI have extended the best in tertiary education to students in Malaysia through degree programmes in IT (major in eBusiness or Network Design & Management), Computer Science (major in Software Engineering, Multimedia and Game Development or Digital Systems Security), Commerce (major in Finance, Accounting, Management, Economics, Marketing or Public Relations) and Communication & Media Studies (major in Marketing Communication and Advertising). Students of the UOW programmes are enrolled as UOW students, which grants them access to on-line resources that are available at UOW. These include e-books, e-journals, and e-teaching and learning materials. For more information on the UOW programmes offered at INTI, please call 03-56232800 / 04-6310138.